Choose a filter that’s right for you! 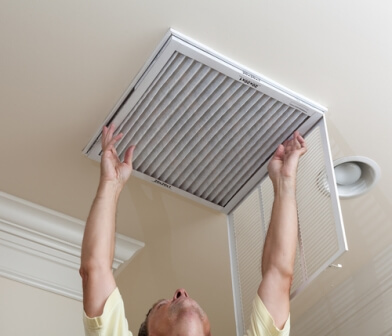 If you want your heating and cooling system to function properly, it is important to regularly change the filter. Here are some tips to find the best filter to meet your needs and the needs of your HVAC system. HVAC systems in Tucson work hard. Since you use the unit so frequently and there is a lot of dust in the air, it is important to change the filter on your HVAC system at least once a month. Use your electric bill as a monthly reminder. Change the filters regularly helps keep your system running efficiently and helps improve your home’s indoor air quality. There are several filter options that help you keep your unit functioning properly. Fiberglass filters are very thin and are designed to protect the HVAC unit. They are also the most affordable option. Note that Fiberglass filters do not improve indoor air quality as much as some other filter options. Although these filters are similar in size to the fiberglass options, they do a better job of collecting dust. Polyester and pleated air filters can get rid of up to 45% of the air pollutants in your home. They are more of an investment than fiberglass options, but they help you keep your indoor air quality at an acceptable level. True to their name, these air filters can get rid of about 85% of the air pollutants that are in your home. Each filter costs about $25, but they can capture even the smallest dust particles to ensure that you have the best indoor air quality. Russett Southwest is here to help you with all of your Tucson heating and cooling needs. Our maintenance services make it easy to ensure that your HVAC system is functioning properly. To learn more visit us online at russettsouthwest.com or call (520) 629-9676.